Having read Tolstoy and Chekhov, I decided it was time to add another well respected Russian author to my compendium. Crime and Punishment would be the natural choice I suppose, but the title of this novel intrigued me and so it is my reading challenge for May! There is a complexity and brilliance to his writing. The book is narrated by an unknown person who tells us the trails and tribulations of the Karamazov brothers. He recalls the events that he has witnessed, but as he goes off on tangents telling his tales, he sometimes shows his cynicism to the events which unfold. Just like when a person you know tells a story and they go off at tangents, so does this storyteller. The book does not have a linear feel, and it can get distracting as you leap from one tale to the next and as a reader you never fully resolve the first tale before moving onto the next and back again. You therefore need to keep your wits about you to recall all the events, and what has happened to whom; this is made more difficult by complex Russian names, and people also being referred to by different nicknames throughout! Don't start reading this book thinking you are in for a quick and easy ride, set time aside and enjoy the complexity and brilliance of Dostoyevsky's writing. The book loosely falls around the murder of someone and it becomes a rather long and complicated "who dunnit". This is by no-means the main focus of the story though, the reader is questioned throughout about their thoughts about crime and justice, the redemption of someone through suffering, and the conflict that families face as they deal with moral dilemmas. It is a highly philosophical novel which questions your beliefs as you read through it. It is set in 19th Century Russia, and Dostoevsky opens up passionate debates on religion and spiritual and ethical questions. He has cleverly created three completely different characters, three brothers, who in their own way try to answer the complex question about human existence. As we read through the book we see the characters evolve, and try to deal with their personal sufferings the best way each one can. Human nature is seen here in all its forms, and you are torn in your feelings as each character develops. At times you feel empathy, anger, despair. You question them, you feel joy with them, you hate them...every emotion you can feel is there between these pages. The main characters are Fyodor (father) and the three brothers, Dmitri, Ivan and Alyosha. Fyodor is something of a ladies man. He is insensitive and selfish, he doesn't care what effect his actions might have on those around him. He is not an attractive man, but he is rich and can afford to throw his money about on lavish parties, and therefore he is able to get the attention of the local ladies. As he falls in love with a woman called Grushenka, his troubles, and the beginnings of his sorry tale begin to unfold. Never get carried away by a woman! Dmitri, the eldest of the three brothers, has also fallen in love with Grushenka. As we know, love triangles never end well, especially when you fall in love with someone as dangerous as Grushenka. In his quest for Grushenka , Dmitri spurns the advances of Katerina, a woman who has lent him a substantial amount of money. As the murder mystery develops later in the book, these events will cast doubt over Dmitri as we see during the murder trial. The youngest of the brothers, Alyosha, is studying to become a monk. He is as far removed from the lifestyles of his eldest brother and father as possible. During his studies at the monastery, we enter a subplot as Father Zosima teaches him the values of the church. As tensions heighten in the Karamazov family, Alyosha decides a life in the monastery is not for him, and he tries to enter the "real world." He takes on the role of carer for a dying child, a plot which serves the purpose of showing the reader how a person's actions can indirectly influence those around us. The final brother is Ivan. If Alyosha is the saint and Dmitri the sinner, Ivan must be the intelligence; albeit a rather skeptical intellectual. His pessimism throughout is rather heartening at times, and it shows his ability to think matters through for himself...however hard he finds things. He does not believe that God will make everything alright, he has his own beliefs which, as we hear him talking his thoughts through with himself, often makes him appear selfish. The path to virtue is being honest with yourself. If you can not be honest with yourself then there is no way that you can be honest with those around you, or see their honesty in them. From a religious point of view, if you lie, you are a sinner, and redemption can be obtained, but only through suffering. This brings into question can there ever be a benevolent God? If suffering is required, what about the suffering of young innocent children? Should they be included? They know no better, so if they lie, do they have to be punished by suffering, or would it be better for them to learn by teaching and compassion? "pray tell me what have children got to do with it? It's quite incomprehensible why they should have to suffer." If God is willing to see children suffering, those who are even too young to have been sinners, it must mean that God gets a kick out of torturing people. And if God enjoys torturing innocent souls, then why should man not follow suit, and why should man revere God? 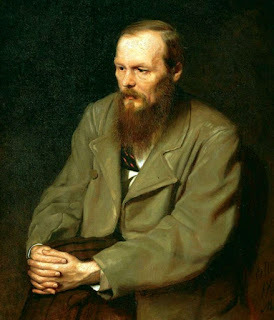 Not surprisingly, the issues about belief and religion and the innate personality of a person is still as relevant to today's reader as it was when it was written by Dostoyevsky in 1880. Liza, another sub plot in this complex story, became an especially disturbed character, purposefully crushing her finger in a door. The ideas of self-harm, living in a fantasy world wanting evil and bad things to happen...to dance with the devil, they are not new ideas, they have been rife throughout the centuries and continue with modern mankind. It is possible to argue that the issues are more prevalent today with the advancement of the internet and social media. In 1880 you could walk away from abuse, today with the advancements in technology it is harder to do. Even if you hit block or mute on an account, it doesn't stop your name being taken in vain; comments are still spread like wildfire from people with no moralistic aptitude to think about whether their actions are justified before hitting the "post" button. People in Dostoyevsky's time were questioned about their morals, and that still holds true to people today. People have, and always will be, walking contradictions. Life is somewhat absurd if you try to make sense of it, and by reading this novel, and "watching" the lives unfold of the characters within it, you find yourself starting to try to piece that jigsaw of questions floating around in your mind.